Mistletoe and Murder reviewed by The Horn Book Magazine! 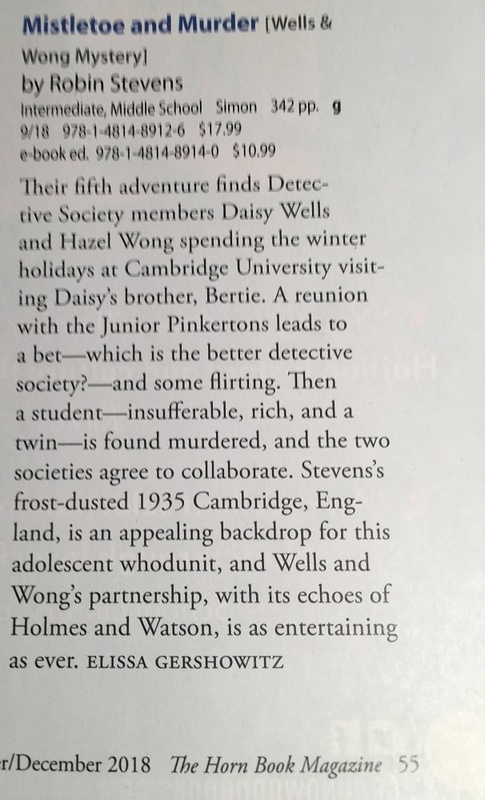 Mistletoe and Murder is out in the US and Canada at last, and I’m very pleased that it’s been given a lovely review by Elissa Gershowitz for The Horn Book Magazine. If you’re in the USA, grab your copy of Mistletoe and Murder now – it’s perfect for Christmas reading! What a great review! It’s so good that lots of people all over the world can read Daisy and Hazel’s adventures. I always read Mistletoe and Murder at Christmas, starting on the day the case begins and finishing on Christmas Day. It really gets me in the festive spirit! Hi Colette, thank you! I love when fans do this – it’s so perfect! That’s great! Also Nevermoor book 2 came out recently, have you read it? I’ve read the first one because you recommended it in one of your videos, can’t wait to read the next one! I have! I’m actually reviewing it in this month’s video – I loved it!